Tagetes is a genus of 56 species of annual and perennial mostly herbaceous plants in the sunflower family (Asteraceae or Compositae). The genus is native to North and South America, but some species have become naturalised around the world. Depending on the species, marigold foliage has a musky, pungent scent, though some varieties have been bred to be scentless. It is said to deter some common insect pests, as well as nematodes. Tagetes are hence often used in companion planting for tomato, eggplant, chili pepper, tobacco and potato. 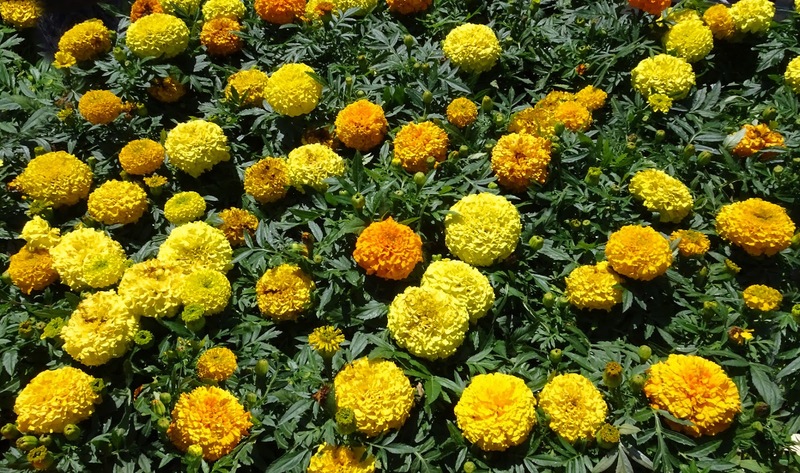 Due to antibacterial thiophenes exuded by the roots, Tagetes should not be planted near any legume crop. Some of the perennial species are deer-, rabbit-, rodent- and javalina or peccary-resistant. This post s part of the Floral Friday Fotos meme. I like the scent of marigolds ... it says 'summer' and 'garden' to me.